President of the Hellenic Republic Prokopios Pavlopoulos on Monday visited the exhibition "Crete. 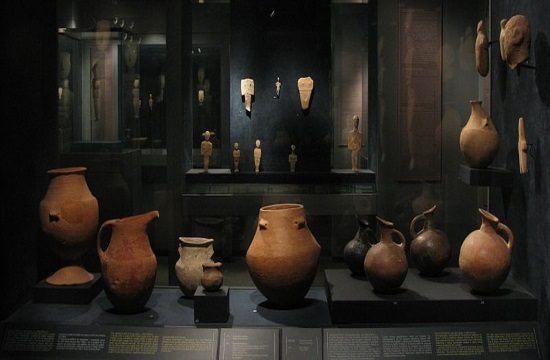 Emerging Cities: Aptera - Eleftherna - Knossos" at the Museum of Cycladic Art in central Athens, where he was given a tour of the exhibits by Prof. Nikolaos Stambolidis, ANA reports. The exhibition explores the finds made at the excavations of three major ancient cities of Crete island, their common traits and also tracks their history from the time of their foundation and rise to their eventual decline and fall, right up to the moment of their final destruction, abandonment or "death". It brings together the largest-ever number of ancient artifacts on show or in storage at the museums and antiquities ephorates in Crete to have left the island for a temporary exhibition in Athens. It also features more than 500 exhibits from old and new excavations, dating from the neolithic to the Byzantine periods, that are on show for the first time. Many of them are linked to the founding myths of each city or specific individuals, such as Sotirios Elefthernaios from Aptera, the 'youth that never knew love' from Eleftherna and the child with toys from Knossos. It also features important new finds from Knossos, such as a Linear A-inscribed sceptre that may help in efforts to decipher the script and expand our current knowledge of Minoan civilisation.